In 2016 the average number of days taken off sick was 6.3 per member of staff, costing businesses an average of £522 per person. Absence is a multifaceted problem. The wages paid to the wounded soldier and their lost productivity are compounded by the time and resources invested in covering them. And to add insult to (hopefully not serious) injury there’s the admin involved in managing this all. In other areas of life you’re insured against such catastrophes. If your house is burgled you get on the phone to LV= and have your stuff replaced. If our car goes bust you claim fully comp and get back on the road. If your Sales Director sprains her knee all hell breaks loose. Why aren’t we, with the exception of a few corporate big-wigs, used to similar provisions for the workplace? "In 2016 the average number of days taken off sick was 6.3 per member of staff. That cost businesses an average of £522 – per employee"
Private medical insurance (PMI) costs up to £1500 per head per year. It’s so expensive because the top four insurance providers dominate 90% of the customer base – it makes economic sense for them to maintain the status quo. Thanks to this lack of innovation, for the few companies that do have that kind of money knocking about, there’s a mountain of paperwork to tackle and a new language of jargon to contend with. As a consequence, people-centric employers and HR managers – quite possibly like yourself – have continued the search for ways of navigating extortionate prices and myriad policies to provide what’s probably the finest employee benefit available. Thanks to the frustration of a new wave of tech-savvy doctors and their innovative startup worker pals, the search is finally over. The following pages will show how by eliminating intermediaries and streamlining outdated systems, technology is paving the way for affordable and accessible employee health cover – for any business. The first wave of digital natives has entered the medical profession, and they’ve wasted no time using technology to scale their jobs. Hindered by outmoded systems and clunky processes, doctors are taking matters into their own hands and revolutionising the healthcare space. Their instrument? App. Apps can play a lot of roles. They cut out middlemen and grunt work. They can access, aggregating and share masses of patient information from various databases within clicks. They can pull together medical services, making them accessible to patients’ fingertips. Most importantly, apps can work alongside our NHS. They can compliment areas in which it truly excels and fast-track patients through areas of friction. Apps like Snapchat, WeChat and WhatsApp have brought us to a reality in which everything happens in real time. We’re using apps to learn, to order food, to keep fit, and to do practically everything in between. Now we’re bringing these expectations to healthcare, and a growing number of organisations in the field are paying attention. Healthy employees are less likely to be absent. Employees who can control their stress have lower absenteeism. Employees with healthy blood pressure, cholesterol, and glucose have lower absenteeism. Employees who are not overweight or obese have lower absenteeism. It wasn’t so long ago that employee benefits were thought of as a retention tool for employers. A goodwill gesture to deter staff from jumping to a competitor’s ship. From napping pods to cinema tickets, there are now near-infinite benefits accessible through myriad channels and platforms, and they have huge clout in the employee value proposition (EVP). So, while until recently health insurance was reserved firmly in the realm of 1000-plus-employee corporates, technology is now bringing it to the masses. Bring these together and good stuff happens. App-enabled healthcare helps clinicians get their jobs done more efficiently, it gets employees treated faster and makes businesses money through reduced absence and improved productivity. The digitisation of healthcare has arrived in line with a widespread drive towards employee wellbeing and an evolution of the capability of employee benefits. These three world changes have converged to democratise healthcare for British workers. This intersection between digitised healthcare, employee wellness and progressive benefits is the new battleground for the employee experience. Like any tech revolution – take automation, for instance – those on the right side will be liberated and empowered, while others are left by the wayside. Like most big advancements in tech, the invention of app-based employee healthcare was borne of a desperate need for change. Having such crucial provisions out of reach for SMEs – the lifeblood of our economy – is patently wrong. It’s similarly clear that, in its current underfunded state, the unwieldy NHS needs innovation to ease its burdens and accentuate its finest assets. Let’s take a look at the growing cost of absenteeism, presenteeism and lost productivity through ill health. Absenteeism is estimated to cost the average UK business £554 per employee per year. The average patient will visits their GP seven times a year. The average time spent away from the workplace per GP visit is six hours; 42 hours per year. The average waiting time for GP appointments in UK is 13 days (and rising). 86% of HR managers reported to have observed presenteeism in their organisation over the last 12 months, compared with 72% in 2016 and just 26% in 2010. The number of people working more than 48 hours a week has risen 15% since 2010. Working longer hours increases risk of illness, while access to primary healthcare on the NHS is in decline. Who wins the healthcare game? The positive impact of instant GP consultations and fast-tracked NHS treatment for both employees and employers is hard to exaggerate. Corporates have been reaping the benefits of using private healthcare as an employee benefits ace-up-the-sleeve since time immemorial, and typically experienced better retention figures compared to their smaller counterparts. Now thanks to the healthcare application development, SMEs are able to get in on the action too. Click here to learn more about Perkbox Medical. Injury can happen to anyone. You’re out running, dutifully, following the guidance of the health campaigners and your significant other. You’re doing laps of the park with growing confidence. While planning your next move you take a slightly heavy turn. Your tibia and lower leg rotate a couple millimetres inward causing a minor lateral collateral ligament sprain. It doesn’t feel minor. You hobble home and start the rehabilitation process. It’s happened before – most knee injuries are repeat – so you know this is where your healthcare struggle begins. While in the RICE position – Rest, Ice, Compression, Elevation – you make your first call to the local NHS general practice. They’re out to lunch. The automatic response says to call back at 1pm. You call back at 1pm. They’re busy. Eventually at 2.30pm you organise the earliest available appointment – midday the following Thursday – when, of course, you’re due into work. You book the afternoon off and miss a few meetings. Musculoskeletal injuries are a real nuisance for two reasons: they’re bloody common and often come with a long waiting list for treatment. As a result, together with minor illnesses and mental health issues, they’re the cause of the lion’s share of absenteeism. As you anticipated, at your appointment your doctor takes one glance at the swelling, another at her notes, and diagnoses you with the same thing you had last time. It’s a sprain with a fancy Latin name. Your doctor refers you to the physiotherapist for a session in two Wednesdays’ time, from 10am. You hobble on with life for 14 days, book a second day off work and push back another deadline. By now the physical injury is compounded by anxiety of missing work and falling behind. Finally Wednesday arrives and you’re going through the motions. You see the physio who gives you a personal training guidance you need to make a speedy recovery. Growing demand on our health system has ramifications in the workplace. In a recent CIPD study, 86% of HR managers reported to have observed presenteeism in their organisation over the last 12 months, compared with 72% in 2016 and just 26% in 2010. To reverse this spike in presenteeism, employees need to be armed with the tools to proactively tackle sickness in an effective way. 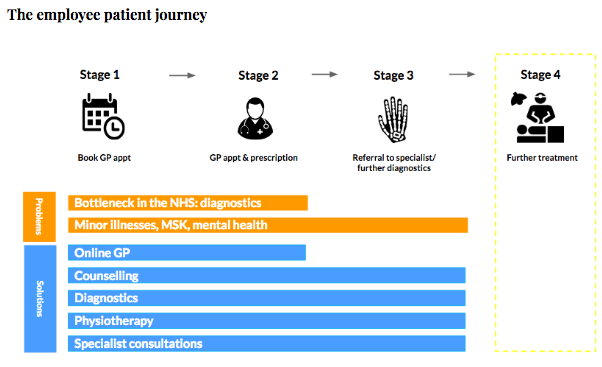 Stages one and two of the diagram are where the majority of problems occur for patients and the health service. The three biggest causes of absenteeism – minor illnesses, MSK and mental health – happen also to be the areas where the NHS is particularly challenged. Stage four is, thankfully, rare. It concerns serious treatment such as chemotherapy, heart surgery, and brain surgery. This is where traditional PMI providers make all their money. Covering these services, services the NHS is best at, pushes up the price of the premiums while providing benefit for very few. The most effective healthcover complements the excellent services the NHS provides – it doesn’t replace them. Perkbox Medical provides businesses of all sizes healthcare that’s affordable, accessible and easily manageable. Working in collaboration with leading healthcare professionals, this app-based employee benefit is designed to marry the might of the NHS with the efficiency of private. 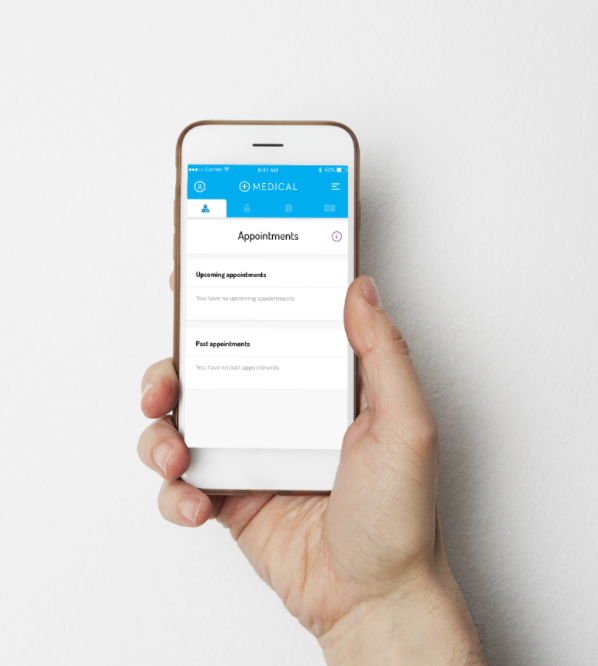 Everything from booking appointments and managing prescriptions to viewing and claiming on insurance lives within one app. See a doctor online in minutes. Address the root causes of absenteeism with free company wide, 24/7 GP support. 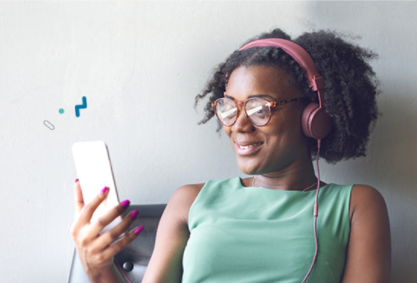 Our online GP app allows employees to book appointments, speak to a doctor and get prescriptions delivered any time, anywhere. If further treatment is necessary, the doctor will authorise diagnostic tests and further consultation referrals. This gives your staff peace of mind. At what can be a difficult period, the authoritative reassurance together with expedited care helps get employees back on form quickly. Access NHS essentials like counselling, physiotherapy and X-rays with reduced waiting times. Using the app, your employees will receive end-to-end private care based on their medical needs. This includes accessing new drugs and treatments from some of the country’s leading hospitals. By focusing only on what really matters to your staff’s wellbeing, we’re able to relieve strain from the NHS and secure you unrivalled pricing. "Perkbox Medical is designed to marry the might of the NHS with the efficiency of private"
From the comfort of their own phone, Perkbox Medical gives employees the agency to proactively look out for their own health, tackling the causes of presenteeism and absenteeism before they arise. The simplicity works both ways. While most insurance schemes require masses of employee data, Perkbox Medical is managed through your platform. As we begin to live longer and work longer – and sixty threatens to become the new forty – we believe health cover shouldn’t discriminate. Perkbox Medical has a standardised price, so whether your team are 16 or 69, just tell us who to enroll. Perkbox Medical is a statement of intent. It comes part of a programme that will raise awareness of the importance of physical and mental wellbeing, building a healthier, more engaged and productive team. Perkbox Medical comes part of a complete employee benefits package. Our range of discounts and freebies, reward and recognition software, and employee feedback tools are designed to enhance employee wellbeing and drive high performance. Together they make it easy not just to reduce absenteeism, but to improve engagement and attraction too. “I’ve recently moved house and haven’t had the chance to register at my new local doctor – partly due to working over one hour away from home. I’d been suffering from cold symptoms – blocked sinuses – for a few weeks. I wasn't technically ill enough to take time off, but wanted to check if I needed antibiotics to clear it up. I decided to use Perkbox Medical because I was able to get an assessment the same day without having to take time off work. We’d love to chat about health and wellness in the workplace to see if Perkbox Medical could work for you. With three tiers of healthcare designed to suit all company sizes and budgets, our unique approach is currently unlike anything existing on the market. We’ll quote you based only on the number of employees you want to cover – regardless of their age, gender, or lifestyles. All taxes are included, and no excess will need to be paid.